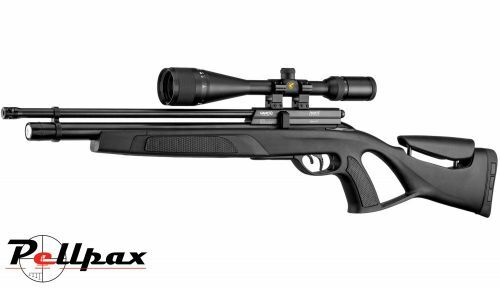 The Gamo Coyote is a great quality, Pre charged pneumatic air rifle from Gamo in Spain. This latest model features an adjustable Black Synthetic stock to make it even more durable and reliable than ever before. The rifle features a large air reservoir which gives up to 70 shots in .177, and 100 in .22, making it ideal for a days hunting. Aloft the air reservoir is one of BSA's finest cold hammer forged barrels for superb accuracy and consistency. This barrel is then threaded and fitted with and Air Stripper, which can be removed to fit a silencer if you wish. The new Black Synthetic stock features an adjustable cheek piece to tailor the rifle to you, and take any knocks and bangs a lot better than the wood equivalent. The bolt action system is smooth and positive, and has a 10 shot magazine to allow you to reload and take that next shot quickly. As well as this the rifle is full power so it packs enough punch for anyone. Add this item to your basket & spend an extra £110.01 to apply for finance.